The VOLCANO CUP - 3rd tournament of the BIG KAHUNA Series - will take place on February 3rd, 2018. 1st place - Volcanic Island (3rd ed. wb, Italian), Qualification for the BIG KAHUNA Invitational Final, Winner's Playmat! If you have any questions, feel free to ask them here. I will answer. Hopefully many of you will be able to make it. Let me add, that there will also be a team challenge alongside the regular tournament. Buyin to this will be 10 € per team. Just register together with two friends and build a team. Your overall swiss performance will be tracked and before the top 8 the best team will grab the pot in the form of store credit at Wizard's Well. Most important thing about this: Choose a sweet name! 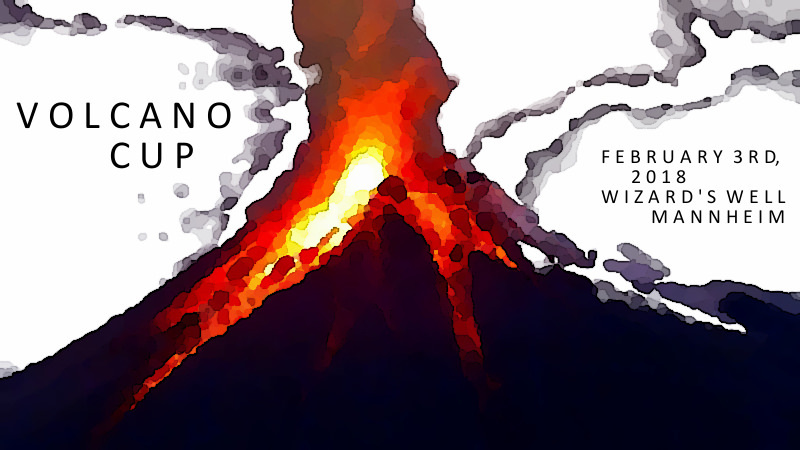 Volcano Cup is taking place tomorrow. Time to give your deck the finishing touch, polish your dice and choose your gametime dress! See you all at Wizard's Well! are there any Plans to perform another "The One" Hihglander Tournament this Year? Currently not. But things may change.